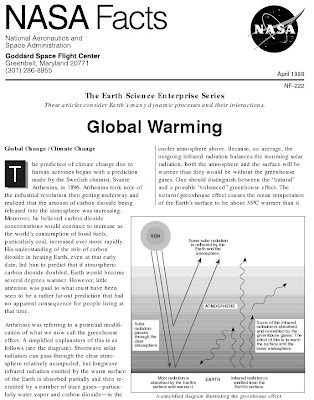 NASA FACTS 1998 (p.3): "The temperature record of the past hundred years does show a warming trend, by approximately 0.5°C. However, the observed warming trend is not entirely consistent with the carbon dioxide change. Most of the temperature increase occurred before 1940, after which Earth started to cool until the early seventies, when warming resumed. Carbon dioxide, on the other hand, has been increasing steadily throughout the past century." NASA FACTS 2002: "Far from being some future fear, global warming is happening now, and scientists have evidence that humans are to blame. For decades, cars and factories have spewed billions of tons of greenhouse gases into the atmosphere, and these gases caused temperatures to rise between 0.6°C and 0.9°C (1.08°F to 1.62°F) over the past century. The rate of warming in the last 50 years was double the rate observed over the last 100 years. Temperatures are certain to go up further." Oh boy, you really got me there- I hadn't seen the rest of the falsified NOAA/GISS temperature record before your link, that is except in this post immediately above your comment and hundreds of other times on this blog. Did you bother to read the 2 climategate co-conspirators emails in the graph, both of which relate to why this period is shown? Did you read any of the other posts on this blog indicating that Phil Jones has admitted there has been no statistically significant warming since 1995, that none of the models predicted this and that's proof they are wrong, that ocean oscillations which can last 60+ years explain all or most of the warming in the 20th century but aren't incorporated in their models, and dozens of other reasons? I didn't think so. BTW your graph "cherry picks" a starting period during which the globe was cooling from the 40s to the 70s. It's funny how Daganstein accuses someone of cherry picking by using a graph that cherry picks.